For the second time this month, Washington Nationals ace Max Scherzer has been hindered by neck pain. This time, the neck issue is enough to send him to the DL. The Nationals placed Scherzer on the 10-day DL Friday night, hours after he was scratched from his start against the Padres. Lefty Matt Grace made his first career start after Scherzer was ruled out. Scherzer also complained of neck pain on August 1 during a start against the Marlins. He lasted just one inning in that game before being pulled. However, he visited a chiropractor, took medication, and was then deemed fit to make his next start without a trip to the DL. He’s made two starts since being pulled against the Marlins, tossing seven innings in each outing. With his neck pain resurfacing for the second time in less than three weeks, Scherzer and the Nationals are taking the more cautious route. Manager Dusty Baker says that the pain that caused Scherzer to be scratched from Friday’s start is on the opposite side as the pain he felt earlier this month. However, the exact cause of the neck inflammation remains a mystery. Before his neck pain became an issue, Scherzer was in the midst of another Cy Young caliber season. Through 24 starts this year, Scherzer is 12-5 with a career-low 2.25 ERA. However, he is now added to a long list of Nationals players on the DL. The silver lining is that Stephen Strasburg is ready to come off the DL and start for Washington on Saturday. He figures to take Scherzer’s spot on the roster. Strasburg has missed nearly a month with a nerve impingement in his elbow. Prior to the injury, Strasburg was 10-3 with a 3.25 ERA in 20 starts. He and Gio Gonzalez have both been great in support of Scherzer at the top of Washington’s rotation this season. The Nationals had the benefit of giving Strasburg plenty of time to recover because of their large lead atop the NL West. Washington should be able to do the same with Scherzer. That being said, the Nationals are confident that Scherzer won’t be on the DL long. He is likely to miss one additional start after being scratched on Friday. But the Nationals are expecting him to return to the rotation soon after that. 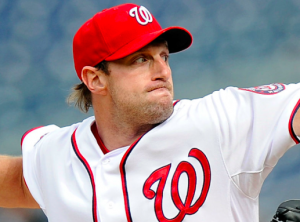 Of course, with the NL East all but locked up, Washington’s priority is that Scherzer is ready for the postseason. If healthy, a trio of Scherzer Strasburg, and Gonzalez could match up with any other rotation in baseball during the playoffs.